Do you want to know how to format hard drive? Well, most people think that formatting a computer is complicated and can be done only by pc experts. But the truth is that everyone can do it easily with little knowledge. In fact, it is very easy to format a computer if you follow the steps carefully. Get here a free how to format computer guide! The guide shows each step with screen shots. It can be used both for Windows 2000 and Windows XP users (almost all the steps are the same for both systems). Why should we format hard drive? When we say, ‘format computer’ it means preparing a hard drive for reading and writing data. Usually it is for installation of operating system and storing your data. If you bought a new hard drive, you should first format it before using for the desired purpose. Formatting computer is the result of many factors. Normally, when we purchase a computer it comes with preinstalled programs, means it is formatted and all the necessary programs and drivers are already installed by the seller or the manufacturer. But after sometime work on it, the computer may get stuck and unable to function properly because of several reasons. However, this doesn’t mean that if your computer gets stuck you should automatically format hard drive. No, depending on the type of problem you encountered, there are many ways to fix your computer problem and formatting is the last option in repairing it since formatting deletes all programs and data from your hard drive. Most of us may think that data can’t be recovered after formatting a hard drive. But the truth is the other way; data isn’t permanently erased from your hard drive unless you use special programs which erase hard drive data permanently. Data can be recovered easily from formatted hard disk using data recovery software. There are many programs out there though very few are successful in recovering data. Once, I accidentally formatted my hard drive without backup of my important files, however, I easily recovered most of my files using recovery software. 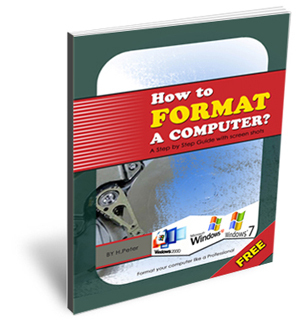 Get here a free how to format computer guide NOW! Here are some of the best programs which can recover files from formatted hard drive. In order to protect identity theft, erasing your hard drive is highly recommended before giving away or selling your old pc. Particularly, if you were storing credit card numbers, bank account information, personal data and other confidential data on your hard drive, then you should completely erase your files permanently. We are trying to see relevant tips to format hard drive. As you may already note that it is very easy to do it. If you are interested, get a downloadable free guide and start formatting your computer hard drive. What are the criteria to choose computer monitor?